Many students love video games. Game-based learning (GBL) capitalizes upon this trend, using games and simulations to convey educational content and concepts. CRYSTAL ISLAND: Lost Investigation enlists GBL to teach eighth grade students Common Core State Standards in reading and science. The game takes place in an interactive story-world, featuring a science mystery about an epidemic that has struck a team of researchers stationed on a remote tropical island. The student’s objectives are to identify the spreading illness; recover scattered pieces of another scientist’s notes; and recommend a treatment plan. 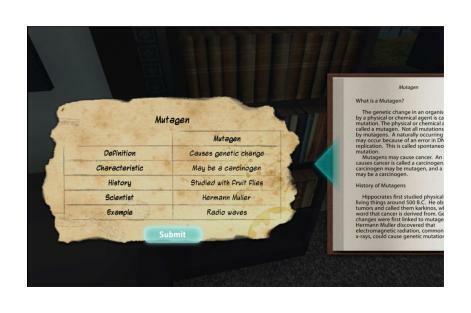 To solve the mystery, the student uses critical thinking and decision-making skills while synthesizing information from conversations with virtual characters, complex informational text from books and articles, and test results from virtual laboratory equipment. 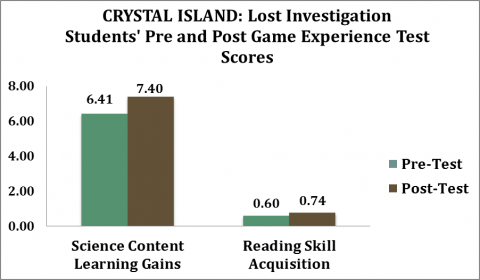 A comparison of students’ pre- and post-game experience test scores shows a significant increase in science content learning and reading skills. In addition, two-thirds of student participants demonstrated the acquisition of deeper knowledge by successfully exercising strategic planning, interpreting technical information, and thinking systematically to determine the identity of the mysterious disease. NCSU plans to deploy CRYSTAL ISLAND: Lost Investigation on a national scale with an enhanced and expanded immersive story experience. Data mining analyses with student log data, as well as work on evidence-centered design, will enable the system to be even more responsive in providing personalized instruction, meet the increased demands and expectations of the Common Core, and empower teachers with real-time actionable analytics. Long-term Goal: To continue the development and investigation of a multi-disciplinary, immersive game-based learning environment aligned with Common Core State Standards on a large scale.